Please follow me on Facebook. Instagram, Pinterest and Twitter. I’m mildly obsessed with all things coconut so it’s no surprise that I have countless recipes using coconut on this site; coconut shrimp, coconut rice, pineapple coconut sangria, coconut cake, and the list goes on. In fact if you do a search you will find 5 pages worth of coconut recipes. I’ve even recently started snacking on coconut chips. Have you ever tried them? If not, you need to! For those of you, who have followed me for a while, have probably seen the abuse of coconut milk, but hey what can I say, coconut milk makes everything better. This weekend I added yet another notch on my belt of coconut recipes with this Coconut Bake. This is a fried bake, not to be confused with the Trinidadian Coconut Bake, which is baked. Whew, that was a bit confusing for those who aren’t familiar with what a bake is and how could it could be fried. 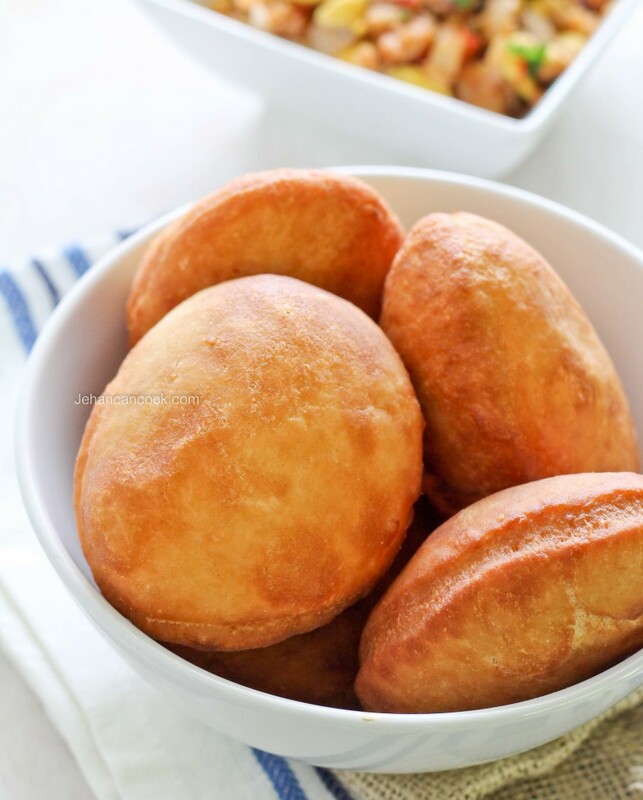 Bakes are a popular Caribbean (and Guyanese) fried dough that’s usually served for breakfast. 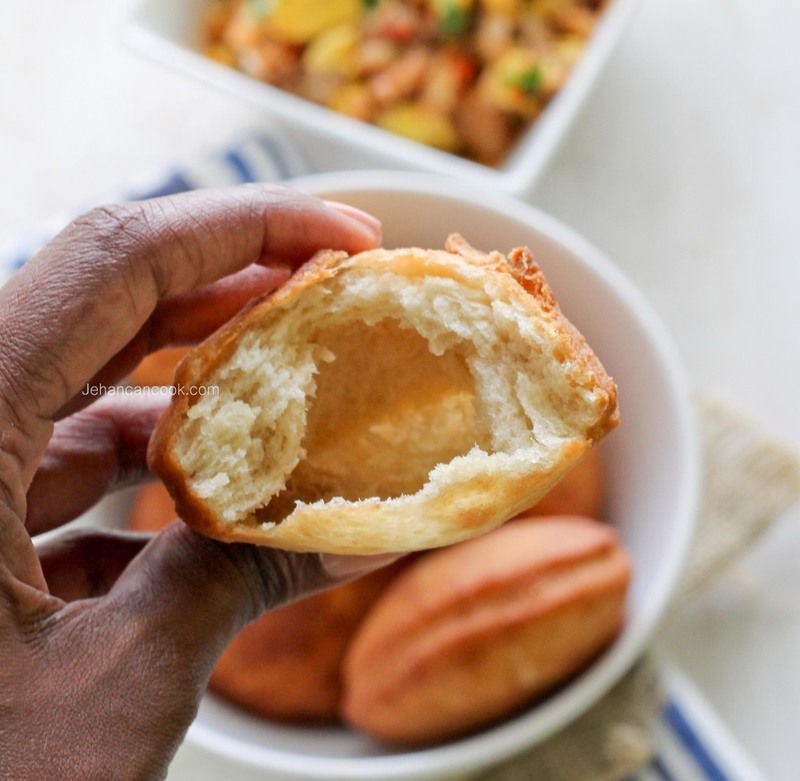 There is quite an array of bakes throughout the Caribbean community; there are fried dumplings, float bakes, Johnny cakes and roast bakes, just to name a few. No matter the name, these are seriously additive and well loved. 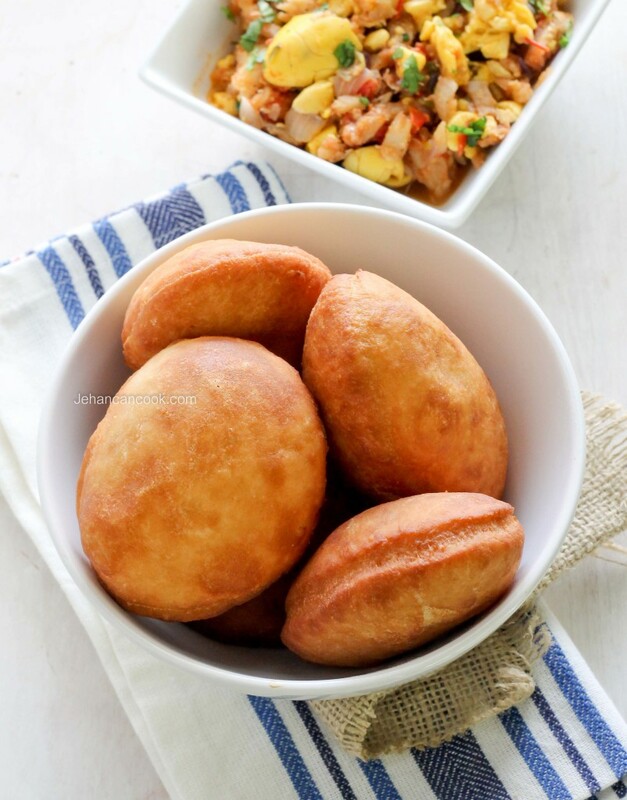 Serve these with saltfish, eggs or simply butter for a delightful treat. I revised my old bake recipe a bit and made a few additions and voila, we have coconut bake! Mix flour, baking powder, sugar, salt and cinnamon together in a bowl. With a fork, or using your hand (quick method) rub margarine into flour mixture. Add coconut milk to make a firm dough, but not stiff. Dough should be easy to roll. Let dough sit, covered for at least an hour. Roll dough to about 1/4 inch in thickness and cut with a biscuit cutter. Heat about 3 inches of oil on a medium fire. When oil is hot, fry dough until golden brown, flipping once. Best when served hot. *Make sure the oil is hot. This makes the dough to puff almost instantly when it hits the hot oil and form a pocket in the middle. Does the margarine work better for both bake recipes? Lashawn, I prefer the results with margarine. Maybe because we tend to use margarine in the Caribbean more than we do butter so the recipes are made with butter. Love fried bake. We do a coconut bake in Trinidad that is a baked round bread with bits of coconut in it. Hugh you can try ghee but I can’t promise that the results will be the same since I haven’t tested with ghee. Chennette, I’ve had the Trini style coconut bake, it’s similar to our Pot Bake in Guyana, it’s so good! We made coconut bakes a lot in St. Vincent when I was a little girl but we added grated coconut too. It makes a big difference! Try it and you will see.